I never speak ill of competitors. In fact, I like them and value them. Whenever I am able to partner with them, I learn a great deal, and they make my work better. So this article might seem like a departure, except I’m not sure if this company is a competitor. I will refrain from naming the company to focus instead on what they are selling. At first, I did not realize this company was positioning itself as a competitor to research firms. Why? Because they don’t do research. They program software. But one of our vendors started telling me about them, and sure enough, I saw this job ad posted in a forum for research professionals. In this job ad, the company does not even pretend to do research. 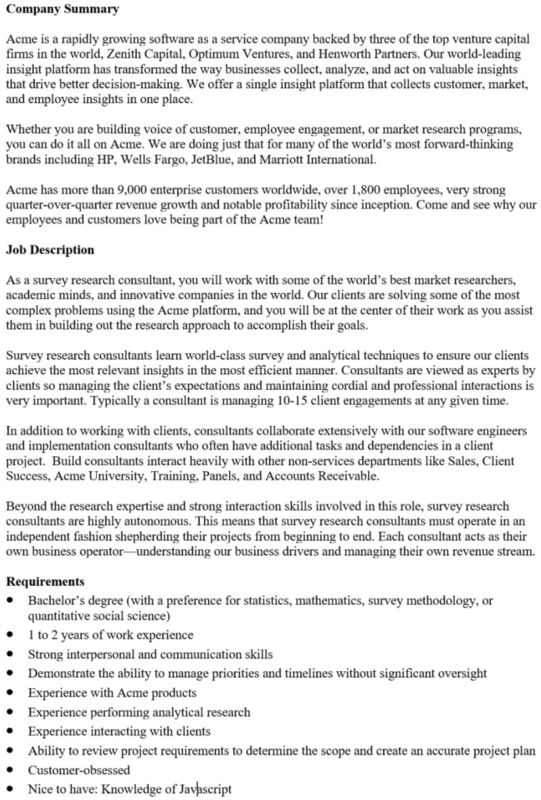 But here they are hiring research consultants who can help sell the idea that they do. They will be fresh out of school with one or two years of work experience (not necessarily in research). If hired, they will enjoy the excitement of learning surveys and analytical techniques on the job (your job). But they need to remember that customers view them as experts, despite having little expertise, so they need to be careful with skillful client management. They’ll be working independently and handling up to 15 engagements at once, which means each client gets, at most, about three hours of their work every week. When you hire our real competitors and when you hire us, you get much more than an aggressively salesy imposter company. You get real experts who have been doing research for decades helping you solve problems. You get people who are always mastering new techniques and innovative methods, but they are not using your engagement to learn on the job. You get consultants who are never handling more than a few assignments; they are always giving you their undivided effort. In short, instead of getting a company seeking new sources of revenue to satisfy growth targets and venture capitalists, you get extremely capable people who are devoted to research and devoted to you because research is the only thing they do.